There are quite a few wedding myths floating through the ether these days. Some are obviously based in old-school ideas and others have been propagated for so long they’ve just been widely accepted as fact. Regardless of where and why they started, we think it’s time to update the narrative. Weddings and wedding planning have changed dramatically within the last 5 years alone thanks to social media — thanks, Pinterest! So, in an attempt to reverse some misconceptions and correct some assumptions, here are our thoughts on the most common wedding myths. 1. You have to spend a lot of money to create a truly memorable celebration. This is probably the most common myth about wedding planning, so if you only remember one thing, let it be this: your wedding will be memorable if it is an authentic reflection of you as a couple, no matter how much you spend on it. We have a hard time remembering any of the no-expense-spared weddings that looked like they were pulled right out of a wedding magazine. But we can easily and frequently recall the backyard celebrations full of handmade details, the desserts that were lovingly baked by a bride’s aunt, and even the modest elopements that required nothing more than a pretty dress and a dapper suit. Your friends and family aren’t there for the food, the favors, the flowers, or anything else you’re told you need to spend a lot of money on. They are there for you. As long as they see that and feel your love, your wedding day will be unforgettable. 2. Your wedding is as much about your family as it is about you and your fiancé. This is, understandably, a sensitive topic for a lot of people. Your families are excited for you two and want to be involved in this beautiful celebration. Unfortunately, when that excitement turns into unwarranted opinions and expectations, it’s easy to lose sight of what you want in an attempt to make everyone else happy. So, allow us to offer some perspective with a small dose of tough love (for your families). This is not just a wedding; it’s the first official day of your new life together. If that doesn’t deserve a celebration that’s all about you two, we don’t know what does! On that day, you will be standing up, baring your hearts, and committing your lives to each other. Yes, your families will be there to witness your love and support your journey. And, yes, we do think it’s important to include your families in your celebration. But you two — and only you two — will be saying those vows. Your parents had their day. Your siblings will have their days, too. Right now, you get to have yours. 3. The groom’s opinions do not matter. Remember how we said your wedding is about the two of you? Well, that means it’s about both of you! One of the common misconceptions is that all women have been planning their weddings since they were little girls, so it should be all about what the bride wants. We disagree. While the bride will likely have stronger opinions on most elements of the wedding, the groom is certainly going to have some opinions of his own. After all, this is an important day for him, too. Be open to his opinions and his ideas. He might offer a new perspective that you like better or, at the very least, it will allow both of you to discover what’s most important to the other person and find a good compromise. 4. You have to invite everyone you’ve ever known. This one, while definitely not true, is also entirely impractical. You do not have to invite your best friend from preschool. You do not have to invite your coworkers. You do not have to invite your mom’s best friend’s cousin. In fact, you don’t have to invite anyone! It’s your wedding and your decision. Your guest list should include the people who mean the most to you and who you want to be witnesses to your relationship. It shouldn’t include anyone you simply feel obligated to invite. Yes, it’s hard to cut people from your guest list because you don’t want to hurt anyone’s feelings. But it’s important for your sanity, and for your budget. Lucky for you, we’ve got some tips to help you narrow down your guest list. 5. The father of the bride is paying for everything. While a lot of fathers do contribute to their daughters’ weddings, we’ve found that a lot of couples today pay for part of their own wedding, if not most of it. And it’s not uncommon for the groom’s family to chip in for more than just the rehearsal dinner. It could be a point of pride for a couple to pay for their own wedding. Or it could be a lack of resources on one side of the family or the other. Whatever the case, we think it’s time to put the assumption that the father of the bride is paying for everything to rest. It’s not a fair representation of modern couples and could be a sensitive topic for some families. 6. Wedding planning is stressful and unenjoyable. Of all these myths, this is the one that breaks our hearts the most. Wedding planning is not the soul-sucking and stressful process so many people make it out to be. Sure, there will be stressful moments, but that’s true of most things in life. 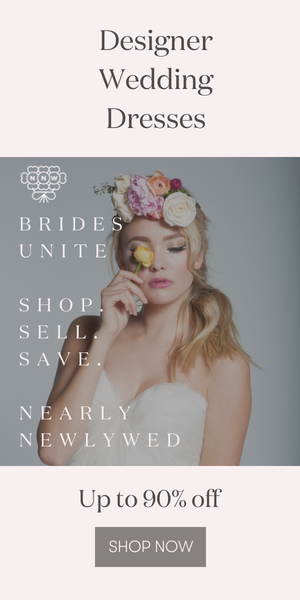 There are so many fun things to balance out the stress: shopping with your girls to find the perfect dress, eating all the food to put together your menu, pouring your heart into your vows, and planning an epic honeymoon. It’s all about perspective and focusing on what really matters. You can easily get bogged down with the details, or you can enjoy the process and take each decision as it comes. How many times in your life will you get to plan a party like this?! If you and your fiancé find yourselves fighting more than usual or stressed to the point that you just want to get it over with, take a step back and remember why you’re doing this. This is a joyful time of your life and, no matter what anyone else says, you should enjoy every moment — it’ll fly by before you know it!